The prototype part is divided in two section. The first is about the calibration of all the stuff under the bar surface that project the images and recive the signals to comunicate with the computer, and another about the bar appearence. The goal in this part was to obtain the bigger size of the rear projection that we can, and calibrate all the stuff under the bar in the best way to have a good recognition of the object over it. This part was very hard to define, because is impossible project a big image if the projector  is too much close to the surface . But it’s not all. With a perpendicular projection is hard to the webcam  recognize the symbols over the bar, because the light coming from the projector is reflected by the surface of the bar and it goes directly to the cam. To avoid this obstacle we have used a mirror . 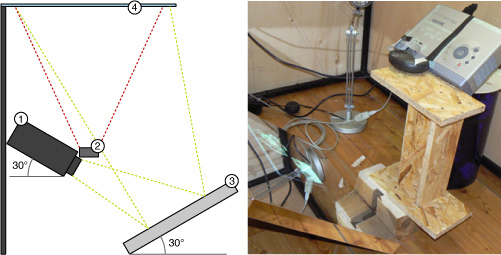 The mirror allow to use an angled projection and increase the distace between the projector and the bar. In this way we were able to have a big size of the image an move the spot of light from the centre of the cam. Find the right angles for all the things under the bar took a lot of time and it wasn’t enough! In fact to calibrate perfectly the cam we needed and should needed different tricks that are better explaned in the programming section. 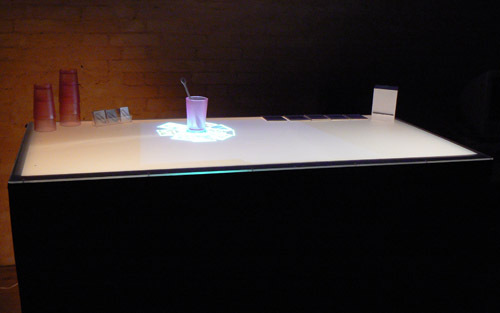 In this part we focussed our attention about realize something that gave the idea that all the surface was active and ready to recive signal by the coasters, but also realize something that looked like a real bar, to comunicate the right feelings. 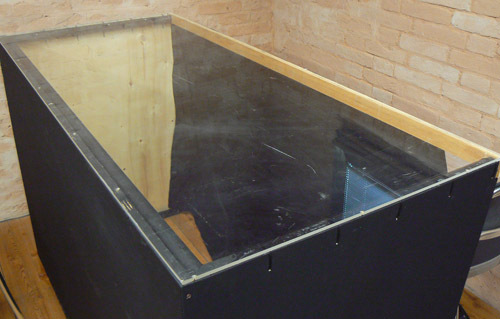 As said before, we were unable to have a big projection and the maximum size we reached was 100×70cm, insteat of 200×70cm (the size of the prototype). 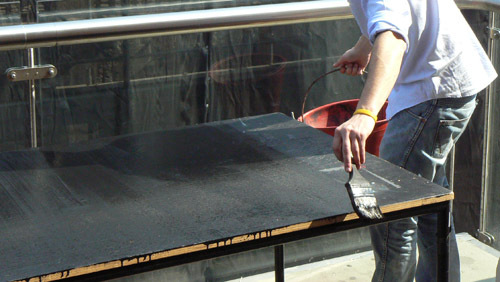 The main structure was made with a big table all painted with black color and lean on one of the longer sides. Then we have covered the smaller sides with two panels of plywood fixed with screews. 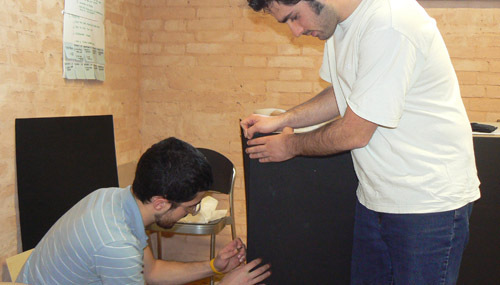 On the back side, to lean the plexiglas making the bar, we fixed a staff at the two legs of the table. 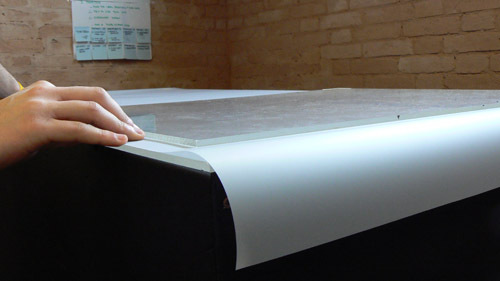 Then was placed a big sheet of plexiglass. 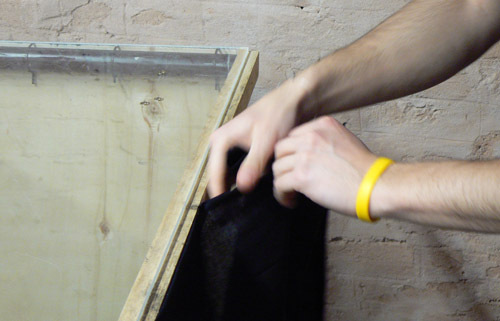 To cover the plexiglass we placed a semitrasparent plastic film. This film was used to project the images coming from the projector, otherwise there wasn’t nothing to see.. Finally, to cover the back and keep much dark as possible the inside part of the bar, we fied a lenght of cloth on the back side. In the end was made all the coasters, the napkins dispenser and the sugar bags. About the coaster we chose to made them using plexiglass and cover it with adesive paper. 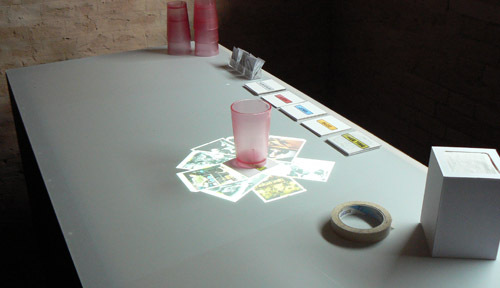 In this way, when the coaster is on the bar it is hilighted by the projector and it gives you the information that it was seen by the cam and the flyer are coming.